When the Mobile World Congress conference happened at the beginning of this year, Fabrizio Capobianco, CEO of Funambol, a mobile application company, described the Android operating system as “a shocking no-show.” Hardly any smartphones there were based on it. That, of course, has radically changed as we approach the end of the year. There is, in fact, so much action surrounding Android on smartphones (GigaOM Pro, subscription required) that its non-phone prospects are being overshadowed. Android has the potential to be disruptive on many types of hardware platforms, and here are four scenarios for what the OS might do beyond phones. Usher in Next-Gen Navigation Devices. I recently asked Chris DiBona, Open Source Program Manager at Google (s goog) and one of the overseers of Android, what he thought of the new Droid phone during a casual, non-interview conversation. He immediately answered that he really liked the new, free Google Maps Navigation for Android 2.0 features, and made some citations that let me know for sure he wasn’t just feeding me a press release. He especially appreciates the fact that you can just pop your Droid into a cradle in your car and it will go straight into the navigation and mapping environment. jkOnTheRun has given the navigation features rave reviews, too, and suggested that they make break new ground for Android in the overall GPS space. Become the Most Flexible e-Book Platform. The looming battle between Amazon’s (s amzn) Kindle eBook device and Barnes & Noble’s Nook (s bks) could “portend the next wave of Android disruption,” Joel West recently noted, hitting the nail on the head. Having Android on the Nook opens the device up to the fast-growing ecosystem of Android applications — potentially a major advantage over the Kindle. It’s puzzling, though, why Barnes & Noble hasn’t included a browser on the Nook device, which would make it even more flexible. Bring Intelligence to Digital Entertainment Devices. MIPS Technologies, which provides processors and architectures for home entertainment, portable multimedia, and communications devices, is moving ahead with a number of initiatives focused on the Android operating system. It has its own Android port that it has open sourced for players in the digital entertainment space to work with. Blu-ray players, set-top boxes, and digital TVs are just some of the hardware devices that MIPS is targeting with its Android port, as EETimes has reported. MIPS has already demonstrated Android running on a home media player and other devices. 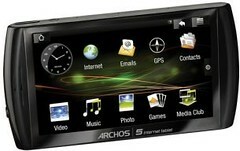 Archos also has its Archos 5 — a slick video player based on Android, and possibly a hot seller over the holidays. It’s shown at left. Biggest Non-Phone Prospects Arrive From Japan. The Open Embedded Software Foundation (OESF) doesn’t get a lot of press in the U.S. and Europe, but it is extremely focused on bringing Android to non-phone platforms, as OStatic covered here. Many heavy-hitting companies are working with Japan’s OESF to take Android to non-phone devices, including ARM, KDDI, Japan Cable Laboratories, Alpine Electronics and Fujitsu Software Technologies. OESF working groups are also collaborating with MIPS on its non-phone Android plans. It’s hard to believe that as recently as April of this year, many observers were wondering if Android had already failed. Fast-forward to today, and we’re seeing approximately 20 Android handsets arrive before year’s end — and numerous promising prospects for the OS on non-phone platforms. The Android platform has seen amazing gains in the past year, it’s been quite amazing. Netbooks, Media Players, Phones have all emerged with no end in site. To be honest, when Android first came out I didn’t think it would ever gain traction… but it has, and quickly. I buy a book or two a week on my Kindle. And leave wireless off at all other times. So I’m using maybe 1 to 3 MB a week? The Kindle browser is so bad, that it is a last resort option. Therefore the consumer doesn’t have to pay for bandwidth. Amazon is paying for it. And they know that the browser is so bad, they’ll do it with a smile on their face. 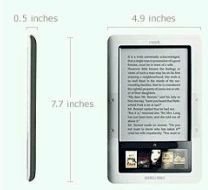 Conceivably the Nook could use the LCD portion to show the webkit based Android browser. But that’s a good browser. I’d use it more often. Therefore B&N eating the bandwidth costs becomes a problem. They’d want to pass it off to the consumer. You skipped VoIP phones. The lowly deskphone could also benefit from an OS – particularly in environments without a desktop computer next to the phone – such as classrooms.